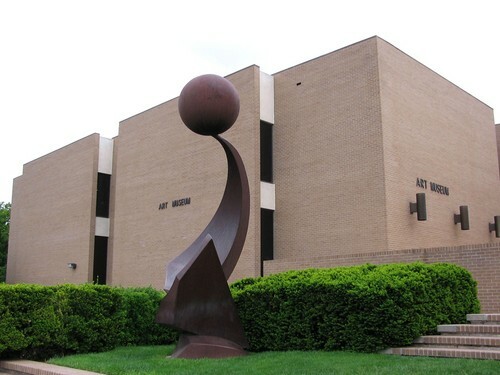 Planning for the Amarillo Museum of Art started in 1967 when a group of community leaders decided to create and maintain an art museum for the benefit of the citizens of Amarillo. The museum’s facilities were dedicated to a woman named Betty Bivins Childers. Childers was the primary driving force behind the realization of community’s vision of having a center for the arts. In 1970, the Board of Trustees and Amarillo college partnered to raise funds for a Fine Arts Complex. Two years later, in October 1972, the Concert Hall, the Museum and the Music building were opened to the public. The art complex was designed by architect Edward Durell Stone. Stone’s notable works include the John F. Kennedy Center and several government embassies across the globe. Stone designed the 24,000 square foot art museum in the late International style. The main construction materials used are steel and concrete, while the exterior walls are clad in brick. Every year, the museum’s six galleries are programmed with sixteen exhibitions that include varying loan exhibitions and pieces from permanent collections. and historical art shows of European and American master works. Pieces from the permanent collection include 17th to 19th century European paitings, 1st century BC to mid 19th century Asian art, textiles from the Middle East, and early to mid 20th century art and photography.